Carnival is the Latin American equivalent of Mardi Gras in New Orleans. Parades, carnival rides and games, dances, music, food and drink make this event one not to be missed. Look for the main streets in the tourist areas to be closed to vehicles. Held the 5 days before Ash Wednesday. Over 1,000 participants are expected to race in either the half marathon or the 5k race. The El Presidente Hotel will host the finish line with a fiesta after the race! For more information, please see www.cozumelhalfmarathon.com. Promoting Cozumel as a premier dive and family location, Hotel Plaza Las Glorias has unveiled the first ever diving festival. 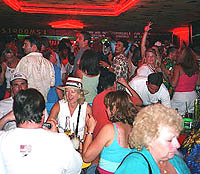 Included in the festivities is a welcome cocktail reception, gift with tickets to Cozumel attractions, a one day car rental, beach games, a disco night and of course, diving in the beautiful waters surrounding Cozumel. Scheduled ocean dives take place the mornings of December 3rd, 5th and 6th. For more information, please email Senora Azalea Grajales, Sales Manager - Plaza Las Glorias Cozumel at agrajales@sidek.com.mx.